Posted by Yilan in Kosovo, Serbia. Greek Deputy FM Dimitris Droutsas has expressed his country’s readiness to support co-operation between Belgrade and Pristina. Speaking at a joint press conference with Kosovo’s PM Hashim Thaci in Pristina, Droustas said Greece had a special role in the talks between Kosovo and Serbia. “We are part of the region and we think that we can play this role, taking into consideration the consequences and responsibilities, of course,” Droutsas said. Both Belgrade and Pristina have started diplomatic manoeuvres to further their causes following the proclamation by the International Court of Justice, ICJ, on July 22 that Kosovo’s unilateral delcaration of independence from Serbia did not violate international law. Thaci said at the press conference that Kosovo is ready to talk with Serbia – but only as an independent state. “We expect inter-state co-operation with Serbia, and there will not be any talks, under any circumstances, regarding internal question in Kosovo,” he said. Meanwhile, Pristina has urged Athens to recognise Kosovo’s independence. Greece is one of five EU member-states which have not done so. Droutsas said that it was up to every country to decide individually whether to recognise Kosovo’s independence. “It is most important to work on the integration of the Balkans into the EU,” he said. Droutsas visited Belgrade on Saturday where he agreed with Serbian FM Vuk Jeremic that the only sustainable solution for the future of the Western Balkans was one that leads the region into the EU. Posted by Yilan in Kosovo. A leading western envoy in Pristina believes the ruling of the International Court of Justice on the legality of Kosovo’s independence will lead to a surge in new recognitions. While Pieter Feith, who is EU Special Representative and head of the International Civilian Office, said he expects the decision to be balanced, he predicted ‘significantly more recognitions’. He also said that the 69 countries which have already recognised Kosovo’s declaration of independence of February 2008 are unlikely to withdraw their decisions following the ICJ ruling, which is expected in July. The comments came at a joint press conference in Brussels on Tuesday, June 8, between Mr Feith and the head of the EU rule of law mission in Kosovo, Yves de Kermabon. Mr Feith added that the ICJ ruling will also have a major impact on international law. He explained that it would clarify an ‘area where international law is not very articulated in terms of the rights of the state and peoples to independence’. Posted by Yilan in Kosovo, Monetenegro. Bajram Rexhepi, interior minister of Kosovo, accused Montenegrin officials of turning a blind eye to the encroachment of its territory, according to the Friday edition of the Pristina daily Kosova Sot. Rexhepi said Montenegrin residents had moved one of the key stones marking the border deeper into Kosovo territory. He said he had spoken to farmers whose land straddles the border zone. “This is affecting many residents of Kosovo, who have their property in the zone, they have problems to use it,” said Rexhepi. Rexhepi said that Montenegrin officials have not responded to prior requests to resolve the border issues. Most recently, he said he sent a letter to the Ministry of Internal Affairs of Montenegro last week, seeking to begin the process of border demarcation. Besides the local land access issues, Rexhepi said that an unclear border undermines the fight against smuggling and organized crime. “An undefined border prevents the application of the European Commission project for integrated border management, which aims to build joint facilities for the control and monitoring of borders,” said Rexhepi. Kosovo, an autonomous Serbian province, unilaterally declared independence from Serbia two years ago. Although it remains under United Nations administration, and the legality of its proclamation is being challenged by Serbia at the International Court of Justice, Kosovo was recognized by Montenegro in 2008. Kosovo police have arrested an ethnic Albanian, Bajram Aslani, on charges of planning terrorist acts in Kosovo and abroad, local media reported on Friday. Aslani, 29, was arrested on Thursday in the northern city of Mitrovica, with the assistance of European Union police (EULEX) and agents from the FBI, the US investigation agency. Aslani is alleged to have connections with an Islamist extremist group in North Carolina, headed by Daniel Patrick Boyd, an American who converted to Islam. Boyd, his two sons and five others were arrested and charged with terrorism charges by a US court in July 2009. They were charged with plotting to wage “violent jihad” outside the United States. Aslani, also known as Abu Hatab, was recruited to join the group by another ethnic Albanian, Hisen Serifi, when Serifi visited Pristina in 2008. According to the US indictment, Aslani was planning to set up a base of militant jihad in Kosovo for recruiting men and to build an arms and ammunition depot. Aslani was sentenced in absentia in 2009 by a Serbian court to eight years in jail for planning terrorist acts, but he was outside the jurisdiction of Serbian authorities. 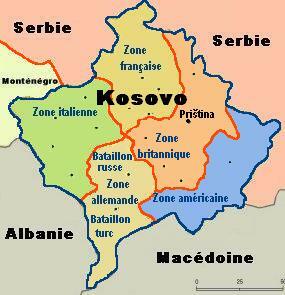 Kosovo was placed under United Nations control in 1999 and declared independence two years ago. The US has asked for Aslani’s extradition to stand trial in North Carolina. If convicted, he could face up to 40 years in jail. Posted by Yilan in Albania, EU, Kosovo. 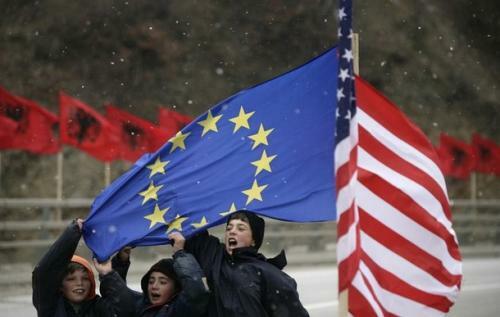 Albania has made progress on reform, but must do more to curb corruption, and all EU Member States should back a common approach to Kosovo, says the Foreign Affairs Committee in two resolutions, approved Wednesday, on these countries’ EU membership prospects. Provided the Copenhagen EU eligibility criteria are met, Parliament should back the eventual EU membership of all Western Balkan countries, it adds. Both resolutions are to be put to a plenary vote in July. MEPs acknowledge Albania’s progress on reform, but stress the need for further substantial efforts to consolidate democracy and the rule of law and foster the country’s sustainable development, including a reform of the judicial system and the fight against corruption, which “is still a prevailing problem”, says a resolution drafted by Nikolaos Chountis (GUE/NGL, EL). The resolution also calls for a solution to the current political stalemate following the parliamentary elections of June 2009. It notes that “fully functioning institutions, especially the Parliament, are the backbone of a consolidated democratic system and (…) an important political criterion for EU integration”. Another prerequisite for Albania’s joining the EU is judicial reform, including the enforcement of court decisions and ensuring the separation of powers in a democratic society. A transparent, impartial and efficient judiciary, independent of any political and other pressures or control, is fundamental to the rule of law, stress MEPs. Albania’s initiatives to waive visa obligations for the EU neighbourhood countries are seen as a positive step that facilitates people-to-people contacts and enhances regional reconciliation. But these initiatives should be taken in parallel with the visa liberalisation process under way between the Schengen countries and countries of the region, say MEPs. The European Commission proposed on 27 May 2010 that citizens of Albania (and Bosnia and Herzegovina) be permitted to travel with biometric passports to the Schengen countries without needing a visa. The proposal is conditional upon Albania’s remedying remaining shortcomings in reintegrating Albanian returnees and enforcing laws to combat organised crime and corruption. According to the European Commission, the monitoring exercise could take place over the summer, so that the Parliament and Council can take a final decision by the end of 2010. The resolution was approved in the Foreign Affairs Committee with 59 votes in favour and one vote against. MEPs “would welcome the recognition by all Member States of the independence of Kosovo”. Taking note of Kosovo’s declaration of independence of 18 February 2008, which has been recognised by 66 countries, the resolution states that “22 EU Member States have recognised Kosovo as an independent country and 5 have not”. To make EU policies more effective for everyone in Kosovo, EU Member States should “step up their common approach towards Kosovo”, says a resolution drafted by Ulrike Lunacek (Greens/EFA, AT) and approved with 45 votes in favour, 14 against and 2 abstentions. Whilst acknowledging that officially recognising Kosovo is not currently a feasible political option for the Belgrade government, MEPs nonetheless call on Serbia to be pragmatic on the status issue and to refrain from blocking Kosovo’s membership of international organisations. The forthcoming advisory opinion by the International Court of Justice on the legality of Kosovo’s declaration of independence should not hinder all parties involved from clearly committing themselves to effective cross-border, regional and local co-operation in the best interest of the whole population in and around Kosovo, they add. MEPs call for practical steps to make the benefits of co-operating with the EU more tangible to Kosovo’s citizens, suggesting that Kosovo should also benefit from the prospect of eventual visa liberalisation, once all conditions are met. To this end, the Commission should communicate without delay to the Kosovo authorities the steps that need to be taken before preparing the visa liberalisation road map, they add. 2010 is a crucial year both for the Kosovo government and for all levels of the administration to make progress on key reforms such as the fight against corruption and organized crime, decentralisation and public administration reform, stress MEPs, who are “extremely concerned by the widespread corruption, which remains one of the biggest problems in Kosovo together with organised crime”. Another cause for concern is northern Kosovo, which suffers from severe shortcomings in the rule of law, increased pressure and intimidation of civil society by radical groups and from organised crime. The EU’s EULEX rule of law mission efforts should be stepped up in the north so as to foster good inter-ethnic relations, and inform the local population about EU action, say MEPs. As Kosovo is not yet in a position to provide proper conditions for reintegrating forcefully repatriated Roma, MEPs urge EU Member States to stop repatriating them. The German and Kosovo authorities, for example, have agreed to repatriate 14,000 refugees to Kosovo, of whom about 10,000 are Roma, gradually. Even where Kosovo has passed laws to protect human and minority rights, their implementation “remains unsatisfactory”, note MEPs. Minorities, in particular the Roma, are discriminated in “access to education, housing, social services and employment” says the draft resolution. MEPS call for more active policies to fight discrimination on all grounds (ethnicity, religion, sexual orientation, disability and others). The authorities should gradually introduce common classes, and the teaching of minority languages, particularly Serbian, to pupils of Albanian ethnicity, and of the Albanian language to all the minorities, since education provides not only skills needed to enter the labour market, but also contributes to the reconciliation among different ethnic groups, says the resolution.